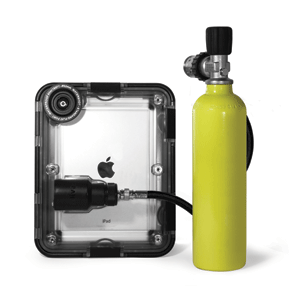 Divers can now record data without having to leave their underwater office with the new iDive iPad Housing device. This product, developed in collaboration between Watershot and Inova Design, Inc., uses Smart Products' Model #132 Side Seal as pressure relief valves within the system's balance module. This application is one way innovative companies are bringing marine science into the 21st century. The Challenge: To successfully use a touch screen device underwater, iDive developers had to 1) keep the device dry and 2) ensure users could interface with it at various water depths. Design Solutions: The first requirement was met with a waterproof housing designed to safely operate in extreme pressures. Next, and more challenging, developers had to create a flexible membrane/pressure balancing system to allow users to interface with the touch screen. As an important design component, the membrane and touch screen must have a physical gap of air between them to allow finger contact to be recognized underwater. Additionally, the housing includes a pressure management system to allow the critical function of bleeding air during ascents. How the iDive Works: The iDive functions with either liquid CO2 cartridges (~800 psi gaseous CO2) or with first stage regulator air pressure (~100 psi) as the input. A unique pressure balancing mechanism, called the balance module, passively uses the input (from the CO2 or air) in direct proportion to the ambient water pressure. 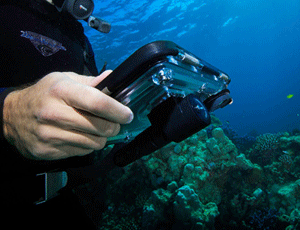 The deeper the iDive system goes, the higher the ambient water pressure. Therefore, more CO2 or air is used to pressure balance the interior of the system against the ambient water pressure. This action protects the device from crushing during a descent by limiting the differential pressure between the ambient and internal pressure. This differential pressure is maintained in a negative range of a few psi, and it keeps the device safe. During a descent, the device is not usable, but the balance module continually balances pressures. The system's pressure is negative, and the membrane maintains contact with the touch screen. Any time the user wishes to use the device, the internal pressure must be increased slightly to a very small - and specific - positive pressure. This action creates the membrane gap. With their ability to function at a precise psi, this device incorporates two Model #132s. Like all of Smart Products valves, they are available in very low and repeatable opening pressures. 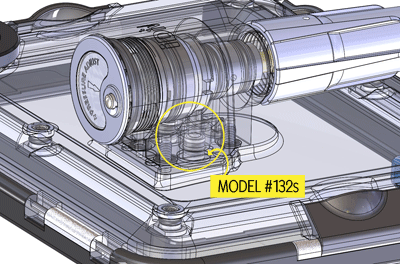 The iDive developers use a manual “pressure up” button to transition the internal housing pressure from negative to a precise positive pressure, which is set by the Model #132 at about 0.15 psi. The iDive is unusable, but protected prior to this transition. Dual valves are used for redundancy. Used as a pressure relief valve, the Model #132s limit and vent the CO2 or air pressure to 0.15 psi during an ascent. While the ambient pressure of the water is decreasing, no input is required from the manual "pressure up" button. "The Model #132 was used successfully throughout the development process, where we tested a variety of cracking pressures. The Smart valves are in contact with salt water and precisely limit internal positive pressure of either CO2 or air to the required value. Production units are successfully in use throughout our oceans," says James Peña, President, Inova Design, Inc. 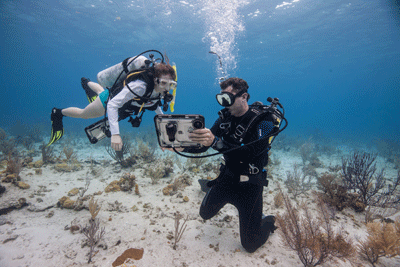 The resulting product allows underwater researchers, marine biologists, and underwater explorers to efficiently record data during a dive versus having to manually record it after resurfacing. According to Watershot.com, the iDive is multi-patent pending and is the only underwater touch screen system known to exist.